Thanks for printing! 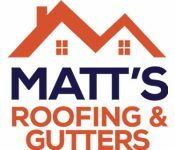 Don't forget to come back to Matt's Roofing and Gutters for fresh articles! They do really good work and they are very professional. Will definitely recommend them. They are very honest and really work with you throughout the entire process. Worth it!